When it comes to electronic publishing, the waters of ebook creation are murky and deep, full of confusing exceptions, varied formats, and non-existent support. Even Apple’s clean, simplistic style is largely absent from its iBookstore publishing program: The company’s tools are primitive and, in the case of iWork application Pages, far out of date. But despite these problems, publishers may now at the least be able to seek solutions from Apple itself, thanks to a new telephone support option from the company. 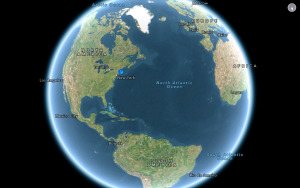 Originally, iBookstore publishers could only query the iBookstore staff about problems via a contact form—one with an incredibly slow response time, at that—or by attending Apple’s Worldwide Developers Conference and speaking to an engineer. The new telephone support line, which is available for publishers Monday through Friday from 7 a.m. to 5 p.m. Pacific, is a major improvement in ebook publisher relations, and a boon for learning ebook best practices, too. 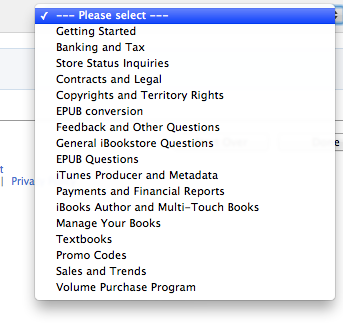 Some of the questions available to ask iBookstore support. 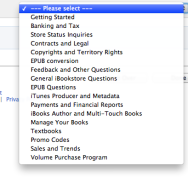 If you have an iTunes Connect account and publish to the iBookstore, you can call the support line at any time for any issue the company already covers under email support. That includes publishing and tax problems, ePub and iBooks Author questions, sales information, and more. Calls are toll-free from the United States and Canada; international rates apply to calls made from outside of these countries. As the Macworld representative for our iBookstore dealings, I find the new phone support option welcome news. Anything that puts publishers in better contact with our publishing platforms will result in better-made books with fewer errors, even if it means that iBookstore specialists may get burdened with the occasional “how do I make a line break?” question. My own brief experience with the iBookstore’s phone support was outstanding: I was immediately connected to a rep, who was not only able to quickly supply me with an answer to an issue I’ve been having with iTunes Connect for ages, but forwarded my issue on to the engineering team to see if it could get addressed. Whether it ever will get addressed remains to be seen, but the mere fact that I was able to so quickly get an answer as to why it wasn’t working is fantastic. 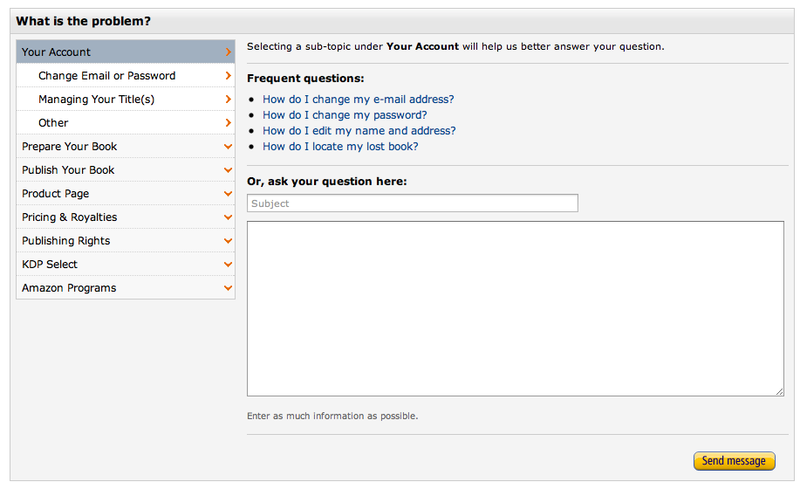 Amazon's Kindle Direct Publishing only offers a web form for support. As many ebook publishers know, it’s not like this on the other platforms. 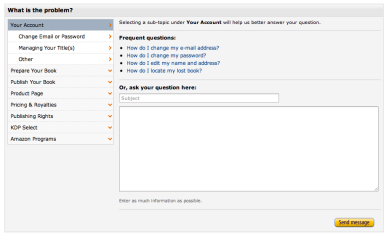 Amazon’s Kindle Direct Publishing only offers a web form—a form which, in my experience, would be better named “The Black Hole Complaint Box,” as I’ve rarely received anything but a form letter after filing an issue. Barnes and Noble’s PubIt! program for the Nook at least offers an actual email address to its publishing partners with a group of humans on the other end, though it’s again hard not to feel like you’re submitting a query into the abyss. For as much as we hate the wait times and the elevator music, phone support is a much more immediate—and personal—way to connect over a problem. This is a great first step from Apple, and, with any luck, the other ebook platforms will follow suit. In the meantime, if you’re a publisher with an obscure question about iTunes Connect, why not pick up the phone and try out Apple’s service for yourself?